The Detroit Handbell Ensemble, one of the finest such ensembles in the Midwest, will present a concert in the Warrendale neighborhood. They will perform in Sts. Peter & Paul Roman Catholic Church (7685 Grandville - 313.846.2222) on Sunday, December 16 at 4 p.m. There is no charge for this concert. Without any doubt at all, this concert is the Cool Warrendale Thing of the Week. What Can the W.C.O. Do For You? A little over a year ago, I posted a question to this blog that never got answered. On August 23rd of last year, I asked: What can the W.C.O. do for you? What is it that a neighborhood group like the Warrendale Community Organization could do that would motive you to get more involved than you currently are? Would you like to a Shop Warrendale initiative to promote retail businesses in the neighborhood? 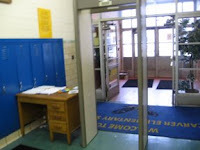 Detroit Synergy does a similar program every December in the downtown, Midtown and New Center neighborhoods. It wouldn't be that hard to expand such a program to include the Warrendale neighborhood. Would you like the group to act as a liaison with the Mayor's Office and the City Council? There have been various community initiatives over the years intended to combat prostitution, drug trafficking and crime in neighborhoods. They have had varying degrees of success. Would you be interested in seeing something like that happen in the Warrendale neighborhood? To everyone who reads this blog I ask: what is it that the Warrendale Community Organization can do that would cause you to become more involved in the neighborhood than you currently are? Please feel free to share you thoughts by leaving a comment below. As the newly elected president of the W.C.O., I look forward to reading your thoughts. 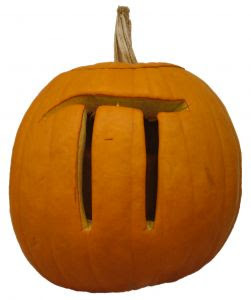 To everyone in the Warrendale neighborhood and beyond - Happy Thanksgiving! I hope everyone who visits the Warrendale blog has a day full of family, friends and really good food. The City of Detroit Senior Citizens Department invites senior residents to dine and dance at the 2007 Holiday Gala on Friday, December 7. The event is from 7 – 11 p.m. in the Michigan Room of the Cobo Conference/Exhibition Center in downtown Detroit. The event is for Detroit residents who are 60 years of age and older. It will include food, entertainment and giveaways. Recommended attire is semi-formal. Space is limited and reservations are required. To reserve a seat, please call (313) 224-5444 by 5 p.m. on November 30. I didn't see this myself, but reportedly Juan's Corned Beef (19533 W. Warren - 313-271-3556) was on Fox 2 Morning News yesterday. The restaurant, located in the former Subway location, gave away 100 turkeys yesterday morning. Something like that is both giving back to the community and some great publicity. More importantly, it's the Cool Warrendale Thing of the Week. 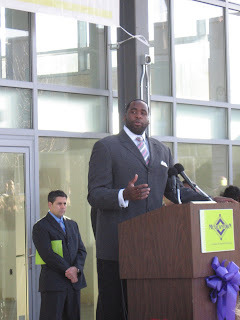 Mayor Kwame M. Kilpatrick announced today that he would convene a meeting of several mayors from around the country to brainstorm tactics for combating the nationwide epidemic of foreclosures. The group is scheduled to meet in Detroit. I applaud Mayor Kilpatrick for making this move. I wish him tremendous success. I simply hope that this effort proves to be more successful than the time he declared "War on Illegal Dumping" in May of last year. I don't know all of the details as of this moment. However, according to witnesses and what I saw myself, a police chase that started in Dearborn Heights ended early this afternoon in Warrendale with a horrific crash on Artesian, just north of W. Warren Ave.
A dozen or so gawkers. There was also a helicopter overhead. However, I could not make out whether it was from a police agency, a local news crew or just a random helicopter. I haven't seen anything about this in the news. I don't know who was being chased or what happened to those involved. If and when I learn more, I will post it here. In the meantime, let me just say this: fleeing and evading the police is a bad idea. Typical. Has anyone notified the mayor's office of this? Or the news or something? I notified Mayor Kwame Kilpatrick's staff of this matter shortly after the meeting. Unfortunately, they have not responded. This, of course, is one more thing to keep in mind for when we go to the polls in 1 year, 11 months and 2 weeks. 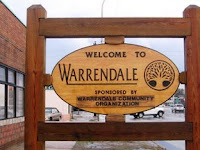 The Warrendale Community Organization held its regular monthly meeting this evening to elect a new crop of officers on an interim basis and to adopt new by-laws. There was also a proposal for the WCO to pursue a bingo license as a fund raising tool. However, the measure was defeated. The Detroit Board of Police Commissioners was scheduled to hold a meeting in the Warrendale neighborhood last Thursday at the new NFL/Youth Education Town-Boys & Girls Club. I emphasize the world scheduled in that sentence because, even though the Commission's staff showed up and dozens of community members came out, the commissioners themselves didn't. This meeting was scheduled to begin at 6:30 p.m. Not one of the commissioners were in attendance at that time. The commission's vice chairperson, the Rev. Jim Holly, Ph.D., eventually arrived at 7:03 p.m. However, he was the only member of the five member commission to bother attending. Of course, with only one member of the commission in attendance, they could not conduct any business. As a result, showing up at the meeting was basically a waste of the community's time. This is not a good precedent to set. Since all five of these commissioners are appointed by Mayor Kwame M. Kilpatrick, I sincerely hope that the mayor communicates to his appointees that they are expected to show up for meetings. One of the cool things about the Warrendale neighborhood is that we're home to the Tipperary Pub, which is a popular hang-out for fire fighters - not just from Detroit but from surrounding communities as well. 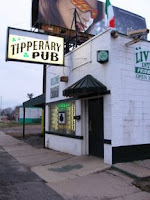 The Tipperary Pub is on the southbound Southfield Freeway service drive, just south of Joy Rd. Tomorrow - as in Friday, November 9 - they will have a special party with the (off-duty) fire fighters. It should be fun. More details are available on their MySpace page. I really need to get a new digital camera and start carrying it with me all the time when I'm in the Warrendale neighborhood. (Most of the photos here are either stock ones or ones that I've used before.) I see some of the most interesting things while I'm out. Last Saturday, on the Southfield Freeway just south of W. Warren, there was a guy in a black SUV who was towing a trailer. Whatever it was that was inside this trailer must have caught fire. I could see the smoke from 2 blocks away. No one got hurt, luckily, but it would have made for some spectacular photos. Yesterday, I saw something that I haven't seen since I was living in New York. There was a car driving along W. Warren Ave, just west of the Southfield, that had a diplomatic license plate on it. I would see those license plates all the time in New York or Washington, DC. However, this is the first time I've ever seen one in the Midwest. I checked the phone book: there are seven foreign governments that have office in the Detroit area. Canada, Italy, Japan and Lebanon all have consulates in downtown Detroit. Yemen has a consulate in Dearborn. The French Trade Commission has an office in Troy. I wonder which one of them was in the Warrendale neighborhood recently? The results from voting yesterday are in. With 100% of precincts reporting, incumbent Annie Carter beat challenger Dwight Thomas with 68% of the vote. She will retain her seat on the Detroit Board of Education. There is no official word yet as to whether or not Britney Spears will demand a recount after the stellar write-in campaign that I launched on her behalf. In other news, voters approved an advisory question and indicated that the State of Michigan should be responsible for a $213 million deficit left by the School Reform Board. Board members indicated prior to this vote that they would seek a lawsuit against the State if the question passed and the State still refused to pay. On behalf of all of the lawyers that I know, I would like to thank everyone for supporting this nonsense. The lawyers will collect a healthy chunk of cash from such a lawsuit. Unfortunately for Detroit's taxpayers, such a lawsuit has little to no chance of prevailing. Therefore, on behalf of the students in the Detroit Public Schools, I have to say that I am profoundly disappointed that so much of our limited resources will be squandered on an effort that is doomed from the start. Last, but not least, comes the news that Wayne County voters have rejected the Wayne County Community College District's request for another 1.5 mills on our property taxes. This is one of bright spots from the election yesterday. Tuesday, November 6th is Election Day throughout Michigan. This brings three for us to vote on in the Warrendale neighborhood. With that in mind, here is my run down in the issues. WCCCD is asking us to approve a 1.5 millage increase to further support the community colleges in Wayne County. Quite frankly, I'm getting tired of one entity after another coming up with one reason after another to ask us for more money. 64 mills on our property taxes. Yes, WCCCD has done an admirable job in recent years. I'm just getting tired of people trying to think of new ways to raise my taxes. Every time someone somewhere talks about raising my taxes for the same service, it makes me want to pack up and leave Michigan. Therefore, I recommend a No vote on this one. There is an advisory question on the ballot as to whether or not the school board should ask the State of Michigan to cover more than $200 million in debt that the Detroit Public Schools incurred while it was being operated by the State of Michigan. There is no way the State is going to cover that debt. It's a waste of time to keep bringing this one up. Therefore, I recommend a No vote on this one as well. There are two people squaring off tomorrow to represent our district on the Detroit School Board. Neither of them has any proposals for improving test scores, introducing teacher accountability nor improving the quality of the schools themselves. Therefore, I am launching a write-in campaign to have Britney Spears represent us on the school board. Ms. Spears clearly wouldn't be any better than either of our actual candidates. However, she wouldn't be any worse. Best of all, Britney Spears would be a lot more entertaining than our actual school board candidates. 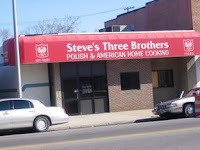 Steve's Three Brothers (17820 W. Warren Avenue) has closed its doors for good. This restaurant has been a part of the Warrendale neighborhood for decades. It's sad to see them go. The building is currently vacant and for lease.